In the beginning of the summer I was invited to be in a book exchange for the first time in my life. I’m very honored and happy to be invited! I’ve been wanting to be in a book exchange for a while, but didn’t feel like starting one myself. So when I got the e-mail from Dawn Sokol I jumped at the chance. Being in a exchange group will mean I get to hold and see other peoples art and keep the things they do in the book that belongs to me! The exchange group consists of five artists that each has gone out and bought a bright and shiny new Moleskine Pocket Japanese Accordian Album (!). It’s a rather cool book format of folded pages that I haven’t seen before. I bought mine in the paper store at NK in Stockholm and I’ve been petting it the whole summer, hesitating on what to create in it like it was something special and precious (though I admit these books are expensive in Sweden)… I couldn’t come up with a good theme and was afraid I would mess it up (would I want to send it out if I made something I didn’t like myself?) – but once I started creating I forgot all about that! I was all about the pages that just “happened”… I made two spreads that make me happy! Shoes makes me happy! And the forward motion of the legs walking towards the next creator and new adventures around the world. I’d love to go on the same trip as this book will go. What will it experience, meeting artists I admire around the globe! What will happen next? I hope it won’t get lost on its travels and that each person that creates something in it will smile and have fun. Wouldn’t that be a treasure to find inspiration in? Saved smiles! 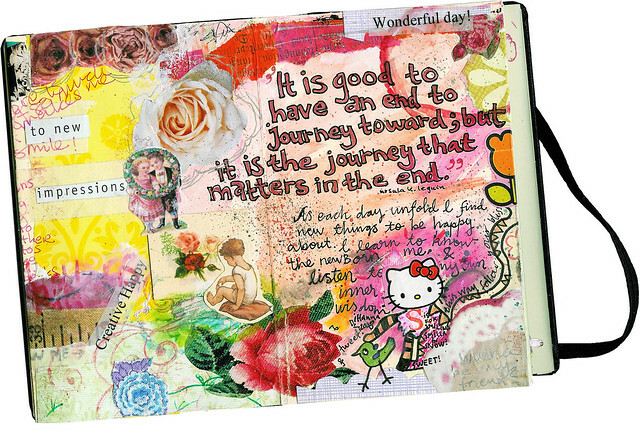 Hello Kitty, birds, roses, watercolors and nice quotes makes me happy! It’s still rather thin, but I hope it will be a bulky book coming back to me in the future! And I hope I’ll receive the other participants books fast – I can’t wait to see and touch and continue on their creation! 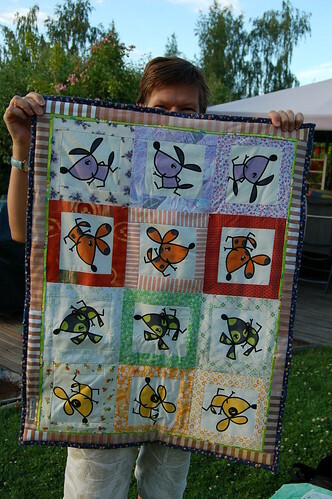 The Dude finally found a home with another friend of mine who bought one of mom’s baby quilts! Wanna see the quilt she sold? It’s so cute! 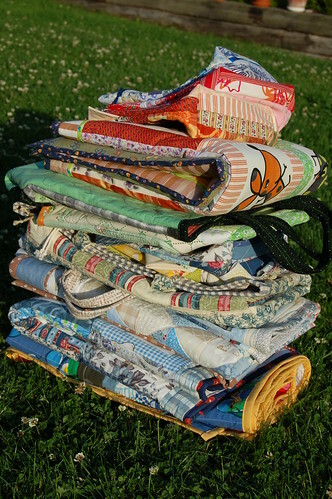 Quilts, bags, table cloths and more! Gotta love the craft! 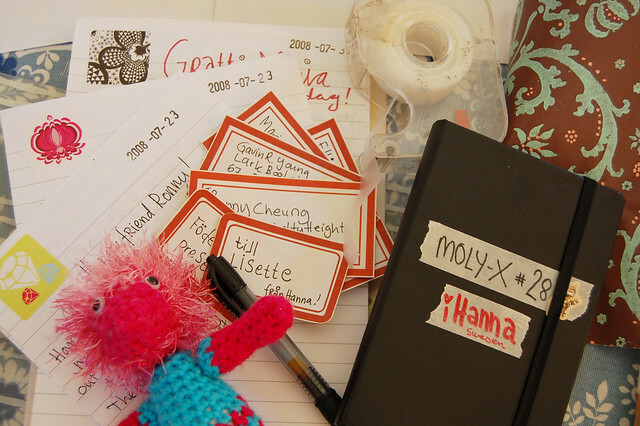 The first Moleskine exchange was started by Marty Harris in Minnesota, US. Each artist has a month to make an entry. The outcome will be a pleasant and surprising adventure, as artists are encouraged to interact and merge their art with others – exciting huh? Personally I’m in group 28 – but now there are already 10 more groups and growing. If you want to join or start a exchange you can buy a book and visit the forum at the flickr group called moly_X! 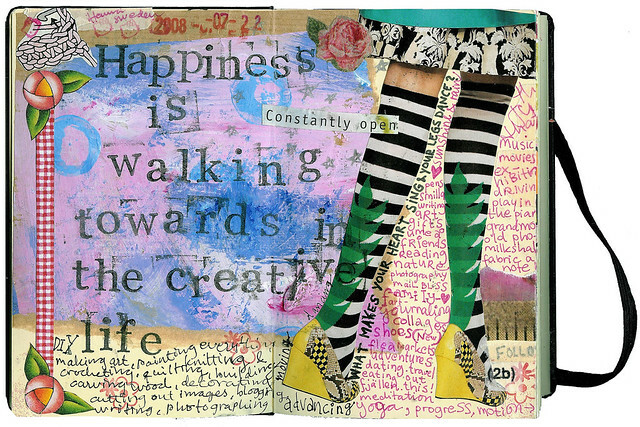 This entry was posted in Mail bliss, Notebooks, Other's Creativity, Paper Crafting and tagged accordion book, happiness, moleskine, momcraft, on a theme, swapping. Bookmark the permalink. I think I have at least two or three at home… thanks for the inspiration- maybe this will help me use them! OMG… I love that book. I never quite got the hang of that kind of exchanges – but the creative love that awakens in my heart when I watch the spreads you made… I’m heading for NK right after work, that’s for sure! Toying with colours, words, doodling, feelings and quotes, I don’t have to exchange it with anyone else, I’d want to keep it all to myself, as a reminder – of joy! Oooo that happiness is contagious Hanna. Thanks for brightening my day! The Dude loves it up north. What fun! I’ve never worked in this sort of moleskine; your spreads are wonderful! Thanks for the labels; I love the colors! 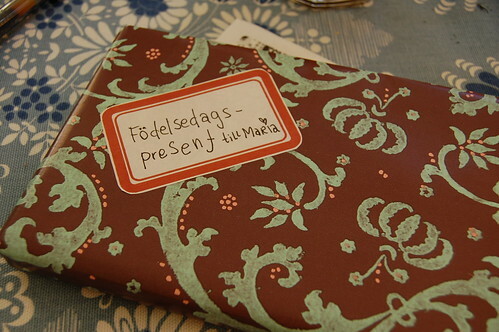 The swap is a great idea,and it’s so great how the Net brings the world together. Makes me want to try it or to dust my own Moleskine off for doodling. Hanna, I get such a rush reading your blog. Even if I don’t have the energy to read.. if I just glance and skim with photos and bolded key words, I tingle. 1. How do you organize your magazines, clippings, collage pieces, etc? Right now, I’m stuck with cutting and using them as I go through magazines.. Do you have some kind of organizational system for certain pictures and phrases you may want to save/use at a later date? 2. How do you have time in life to do so many wonderful craft things AND write about them? Thank you for all your lovely comments! You make me blush! 1. How to organize your clippings? Folders filled with frogs and birds – but I tend to use transparent A4-folders right now and just fill it with whatever I have until I need another one to fill and stack them all in a big plastic box that is on the floor! It’s not organizing, but I love just digging through these folders to find anything that catches my eye. I seldom look for a “special image”, I go with what I find at the moment. Ask again if you want to know more. 2. Time for wonderful things? Wouldn’t it be a sad life otherwise? ;-) Well, I’ve been in school and then out of a job and I tend to do what I like on my spare time. I like to create and I love to write about it. And I haven’t had kids, a dog, a full time job, a big house or a garden so most of the time I can sit and just DO. If you’re looking for more time to create, turn of the TV sometimes too! Your Moleskine is such an inspiration. They’re expensive here, too, and I have recently started buying other notebooks I found at a local art supply store, but there is something very unique and special about a Moleskine, so I just indulged in a new one. I have a moleskine that I have been petting for a while too. I have never used one before. Your pages look great–have fun with your book exchange project! What an amazing idea. I wonder who thought of that. How lovely to have spreads from other artists in your very own book. 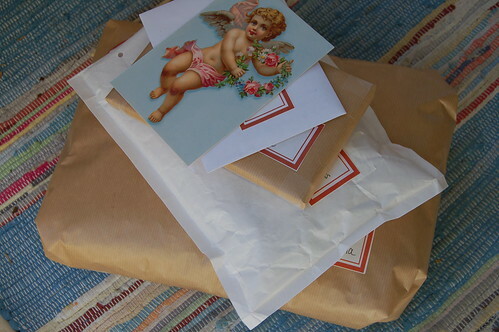 Good luck with the exchange and I hope the postman keeps them all safe. Your spreads are gorgeous and colourful. 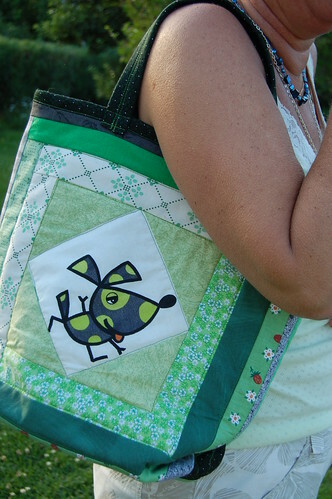 Pingback: iHanna’s Creative Space » Blog Archive » Tutorial: How to handsew a patchwork ball!